Celtic mythology and symbolism is big on balance. There is a moon goddess also worshiped by the Celts, who is associated with the lunar cycles. 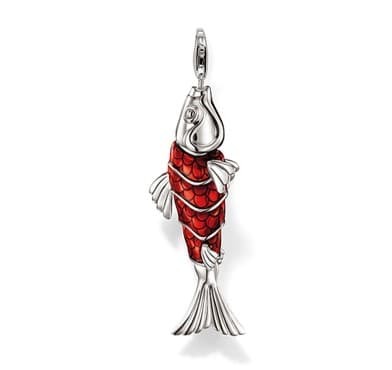 What do koi fish pendant leaping against the wave means? 1.Koi Fish Jumps Over the Dragon’s Gate Painting: from a long legend in China. (?????) Symbolize big success in the civil service examination or getting a big promotion. 2.Wave designs in jewelries symbolizes the ups and downs we see in life. There are times when you feel high, and there are times when you feel low. Wear this pendant as a reminder to stay positive, happy, and strong regardless of what life throws your way. Feng Shui Koi Fish is a symbol of wealth and prosperity – the Chinese word for ‘fish'(yu) has the same pronunciation as ‘abundance’. It’s gold characteristic is a highly regarded auspicious color in Chinese culture. 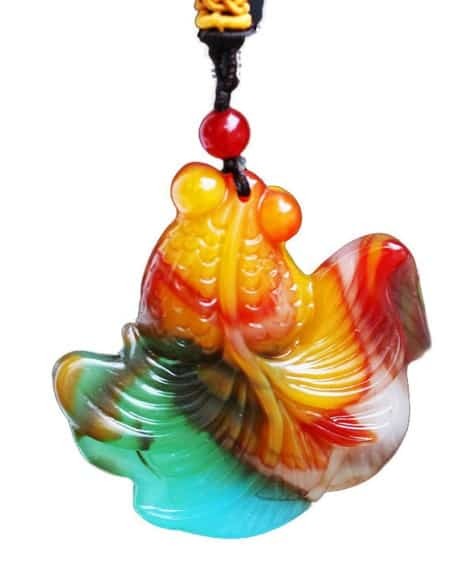 This asupicious Koi Fish Pendant will bring good ‘chi’ and vibes that attract good Feng Shui and abundance in prosperity as well as good fortune to those wearing it. 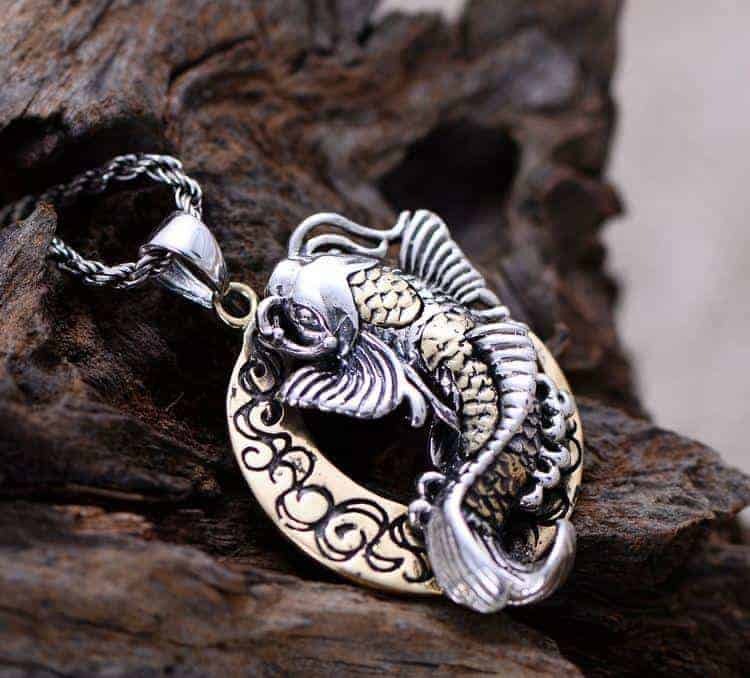 benefits of wearing fish pendant specifically koi fish pendant. Koi fish necklace will boost my morale whenever I felt discouraged during stormy times of my life. Just like the story of koi fish struggle swimming upstream to reach the summit in dragons gate. He wanted to reach the summit because He wanted to become a dragon. It is not an easy cake walk for him. The Gods tested his patience by sending waves, strong winds, strong current, thunder, and lighting. But the little koi fish did not quit. He perseveres and continues to reach the summit. The Gods are happy and rewarded him and transform him into a beautiful dragon. This is similar to our lives. We will face obstacles and challenges in our lives but If will just persevere and continue to press on forward to our goal no matter what. we will be successful let’s believe in our selves and with Gods help we will succeed. related to courage, overcoming adversity, the ability to attain the highest goals, and strong character. affordable 925 sterling silver, yellow gold plated, rose gold plated sterling silver. There are some made up of sea stone that was handcrafted and hand painted. 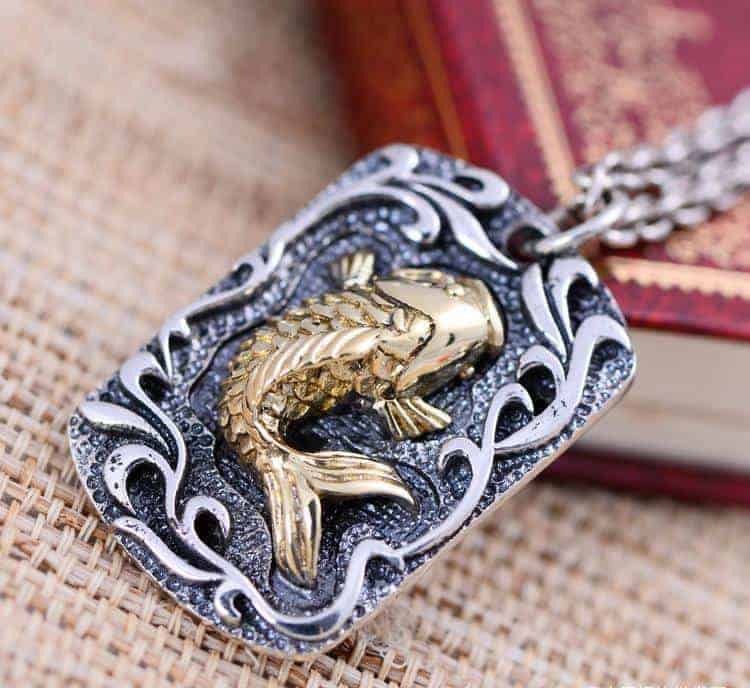 some have been painted with lots of love and extreme care with details that make the koi fish necklace or koi fish pendant carving so realistic. 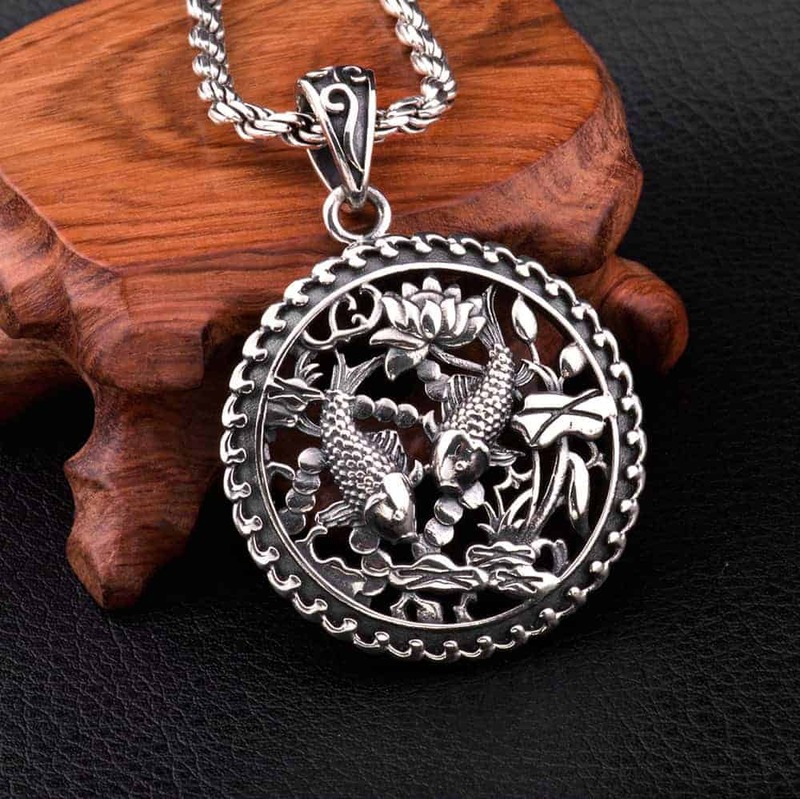 Koi fish necklace some are made up of a vintage style chain with koi fish pendant locket and watch inside. The images are crafted carefully on top of a dome crystal glass to cover and protect it from ambient. That was not made of resin, epoxy or plastic it is actually made of highest quality Glass and metal. The significance of koi fish pendant in feng shui is wealth and abundance. In addition, koi fish has the ability of fertility. 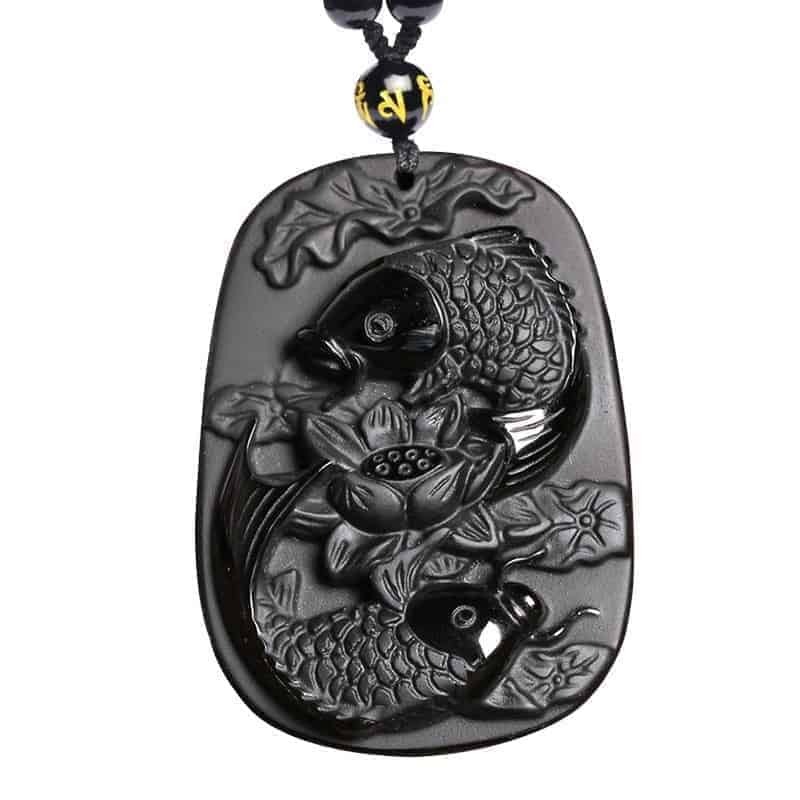 … Wearing koi fish pendant (fish pendant) is believed to bring a chance of getting wealth. This jade fish pendant (koi fish necklace) is made of jade and has an adjustable length. Feng shui fish statues have arowana fish, dragon fish, carp fish, golden fish, feng shui goldfish and double fish. The feng shui fish symbol is wealth and abundance. Displaying good luck fish statue or fish picture can bring wealth luck. Wearing an ‘OM’ charm is said to bring harmony, peace and eternal bliss to the ones who wear them. A pair of fish carries a somewhat different meaning. “Like fish in water” is a common Chinese saying used to describe two people in love. A jade pendant carved in the shape of two fish swimming together represents two lovers and is considered an appropriate gift for a young couple. variety of quartz, composed of silicon dioxide. presence of iron oxide, rather than cinnabar. in red and at Chinese New Year, red decorations are used to bring luck. as a lucky stone that makes an excellent amulet or gift. items of the Ming Dynasty (1368-1644). 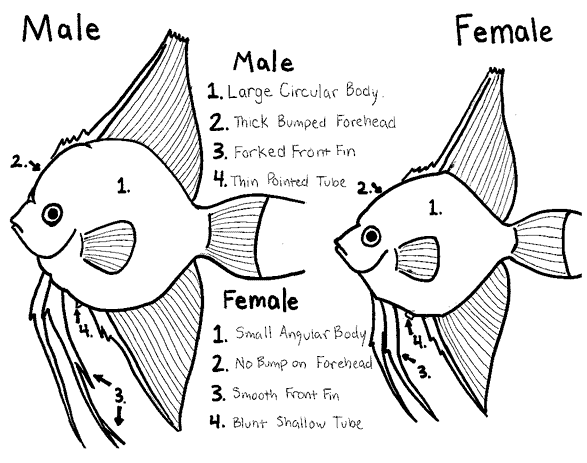 What does the fish represent? Fish symbol also symbolizes salvation in Christ through water baptism (1 Pet. 3:21). The fish symbol (Icthus) is actually an ancient code used by Christians to identify each other. What does a fish charm mean? good luck, good fortune, long life, children, etc. The significance of the fish is taken directly from the Bible. It may derive … Probably the most popular way to wear this religious symbol are with fish pendants . bring more chance of getting wealth. 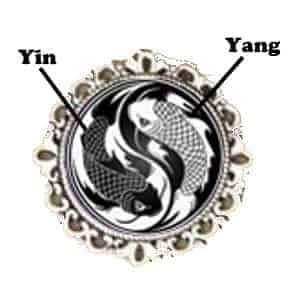 In addition, double fish pendant can remedy relationship problems and improve harmony. Dragon Fish Jade Necklaces. In feng shui, fish represents wealth and abundance. It is used to attract prosperity and wealth. The hidden or implied meaning of Chinese charm symbols. Pendant Charms, and Coin Inscriptions. astrological lucky charms. … Many people wear little carvings of fish as a means of ensuring wealth and good luck. … Do Bajrang ban path for seven times a day Wear mahamritunjaya yantra locket in black thread in neck on auspicious. 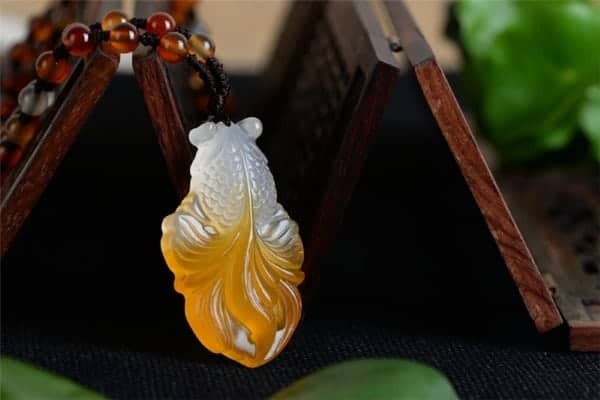 This asupicious Gold Fish will bring good ‘chi’ and vibes that attract good Feng Shui and abundance in prosperity as well as good fortune to those wearing it. he main benefits of wearing gold jewelry includes prevention of black … times to symbolize wealth and luck as well as strengthen confidence. how to make koi friendly One of the best features of Koi fish is their lack of fear for humans. 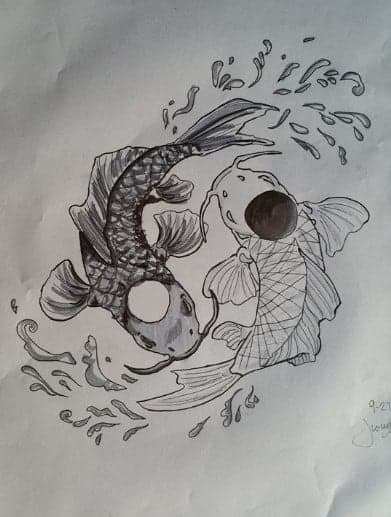 Once the Koi understand that you are not going to harm them, and that you are the one who provides them food, they will likely eat right out of your hand with the right training how to tame koi fish. Hand feeding can be one of the funniest and most entertaining experiences. Koi fish are none-aggressive fish. Koi do not have teeth, so you will not get bit if you decide to attempt to feed your Koi out of your hand. This even allows you to get smaller children involved. 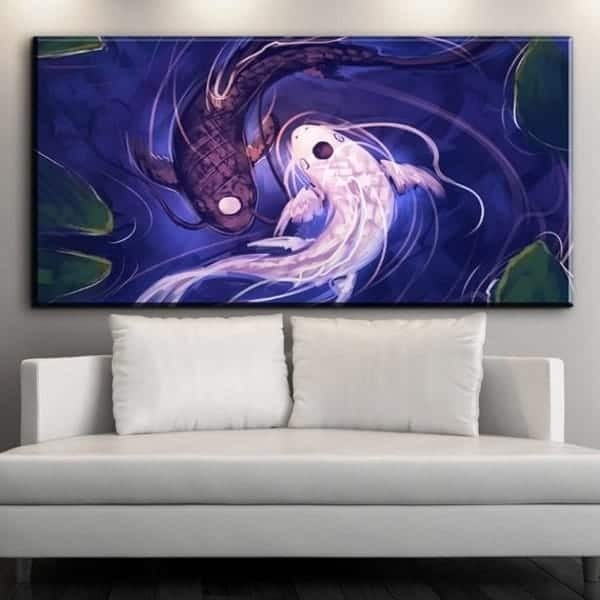 Smaller children will be delighted by the beautiful colors and gentle nature of the Koi. Koi, like any other wild animal, will naturally be afraid of you in the beginning. Instincts tell them to be afraid of you, which is what keeps them alive in the wild. You must build up trust with your Koi, and this takes time and patience. You will not be able to hand feed over night. Koi are omnivorous fish, which means they will eat both meat and plants. This means that their diets are very versatile. Koi will eat pretty much anything that you put in the pond with them, no matter if it is good for them or not. Since Koi do not have a sense of what is bad and good for them, as their owner you must control their snack diet. Another potential problem is over feeding koi fish treats. Again, Koi fish do not have the knowledge to know when to stop eating, and weight issues may come from overfeeding none nutritional foods. The healthiest treats for Koi are what they would find naturally in their ponds, such as earthworms and tadpoles, but it will not hurt to feed Koi treats such as lettuce, bread, fruit, and veggies. You should pay special attention to the certain foods such as corn, beans, and grapes, as they contain an outer casing, which cannot be properly digested if swallowed by Koi. If you must feed this type of foods to your Koi, be sure to completely remove the outer casings before giving it to your Koi. The trick is to start slow. Never make any sudden movements, as this will scare even the most trusting of fish. It will be best to begin hand training your fish from the very moment you get them, but it is not impossible to train a fish that you have had for a while either. Begin by placing a few pellets or snacks in your hand and submerging your hand under water. Slowly allow the food to fall out of your hand into the water. The Koi fish may not seem to be paying by attention, but rest assured that they are aware of your hand, and are aware that you hand is providing the food. Do this for a couple of days. After you have dropped the food into the koi pond for a couple of days, and have gained the interest of your Koi, begin making the fish remove the food from your hand. If the Koi refuse to take the food from your hand, do not feed them that day. You will not stare your fish in this process. They will quickly get the idea that if they want to eat, they must get the food from you. Doing this everyday will get them comfortable with you. Once you have the fish eating out of your hand, then you can start getting your Koi to eat the food directly from your fingers. If the Koi will not take the food out of your fingers, do not feed them that day. Food is your number one motivator when it comes to wild animals, and no fish will simply stare itself because it is unsure of the situation. Once your koi fish are comfortable with hand feeding, you can alternate between hand are regular feeding. If you are in a rush, there is no reason to attempt to take the time to hand feed. Also, once you get your Koi taking food from your hand, be careful when allowing visitors to feed your fish. Always supervise children and adults alike, making sure that they are feeding the fish proper foods, and not making any sudden movements that will scare the fish. koi feeding ring This floating 12″ ring isolates food so you can easily view your fish as they eat. It can also be used to keep floating plants out of your skimmer. How do you train koi to eat out of your hand? Once the fish expect to find feed here you can slowly put your hand under the water while they are eating. Keep your hand very still. After the fish are no longer afraid of your presence begin reaching into the ring with a fistful of yummy pellets. Don’t remove your hand until koi begin to eat. Do koi fish like to be petted? Koi are not what you might consider a traditional pet, but they offer some of the same advantages. Koi can be a calming addition to an outdoor garden or an indoor pool or aquarium. 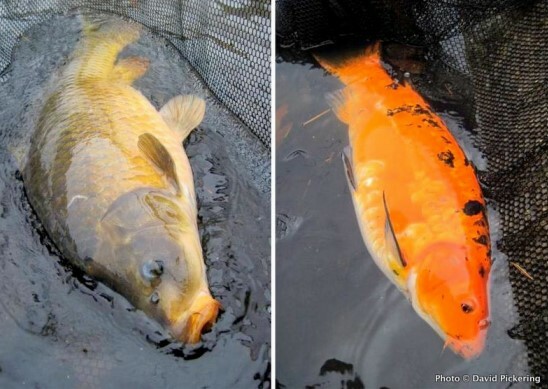 Koi may look like large goldfish, but the two are only distant cousins. Koi are actually more closely related to the common carp. When can I start feeding my koi? Feeding Koi In The Spring. After a long winter, koi owners are often eager to feed their fish as soon as possible, but always wait until the water has warmed up to at least 48°F / 9°C. It is also a good idea to start the pump and filtration system before you begin feeding to allow for proper breakdown of fish waste. How long can koi fish go without food? Many experienced fishkeepers routinely leave their charges for two to three days without making any provisions for feeding. Almost any fish can go that long without fish food (more about that later, as well). However, if you’re going away for longer, some preparation may be needed. Can you overfeed koi fish? The most common feeding mistake is overfeeding. This is because the feeding process is arguably the most fun you can have with your fish. At feeding time, koi come up to eat so you can see them and interact with them. … Overfeeding occurs anytime the fish are eating more than they need. What do koi fish like to eat? Koi fish eat just about anything, from small bugs and insects, to plants and algae at the bottom of the fish pond, to store-bought koi fish food. Koi will even eat people food. They love cereal, lettuce, shrimp, rice, peas, watermelon… pretty much anything we like, koi fish consider food. how to build a koi pond. (trapal pond)is the Favorite choice of poor man’s koi fish keeper and koi fish breeders here in the Philippines. It is easy to build though it won’t last long at least you can enjoy using it for years if proper maintenance and care are done. Pro Tip on how to make your Trapal koi pond last long. Make sure it will not have direct sunlight install roofing to your trapal koi pond the best roofing material is plastic cover in order for the sunlight can penetrate but will not damage the trapal koi pond. Make sure that the water level should be at the topmost level of the pond the water protect it from harmful sunlight rays that will deteriorate it faster. Here is another video of my trapal koi pond that I built with bamboo frame. 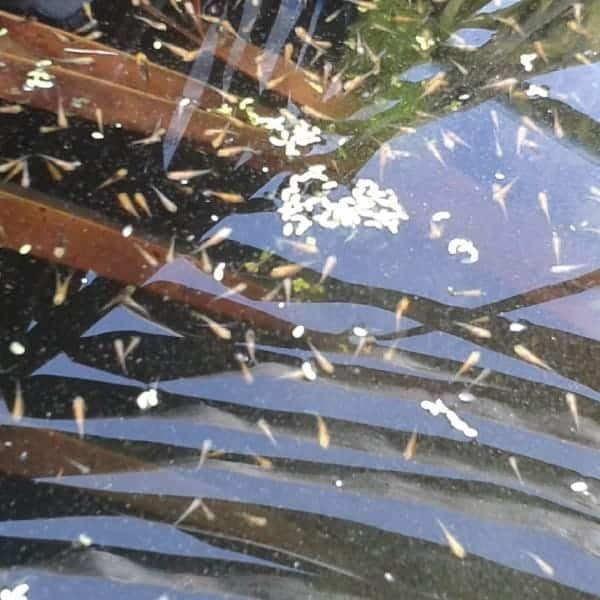 Here below is the photo of trapal that are used as pond liner for most koi keepers and other fish keepers in the Philippines. Build the trapal koi pond frame it is up to you what materials are you going to use bamboo or wood. You can also dig the ground if you prefer not to build trapal koi pond frame. I highly recommend this since it will make your trapal last longer than raised koi pond design. After you are done with the frame or dug a hole in the ground check the grounds if there are any sharp objects like stones, nails, roots of the trees etc and then add protection like carton or newspaper. After they are now in place secure them with u nails to stick them if you are using bamboo or wood frame for the earthen koi pond place stones to each edge to hold the trapal. add water and then install also your filtration system my suggestion is used airlift filtration system it is cheaper in power consumption, your safe for any electrical shock and does not clog up like the submersible pump. 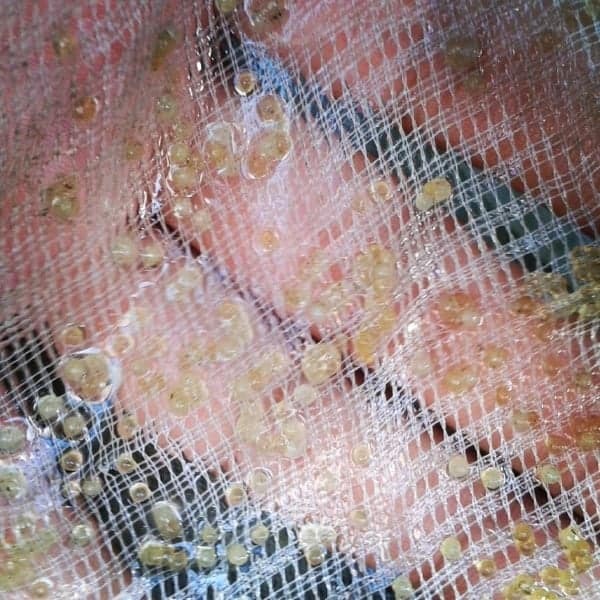 After your filtration system is installed run it for a week before adding your koi fish. Tarpaulin pond for profitable fish farming Fishes are raised in an aquatic environment. Fish can be cultured anywhere there is water. Constructing a Small Fish Pond in the Garden: Our home garden hosts a lot of money … I have purchased a water-proof tarpaulin of 6 ft x 9 ft size. I was wondering if this technology is still being practice in Dumaguete City, Negros Oriental. I personally have seen this display at Buglasan festival way back early 2000. I think the Filipino inventor of this technology is a Filipino from Siquijor. I tried searching the net to find any article that featured this technology since I am interested to learn this since it will be useful in my koi fish business transporting koi fish from distant places. So I came upon on this site https://www.worldngayon.com/2012/07/waterless-live-fish-transport/ This was posted wayback in 2012. I was hoping that the contact information of the inventor here is still working. Transporting live fish possible? Yes, it’s not magic but through hibernation. This is what the multi-awarded Filipino Scientist Bonifacio “Boni” Comandante Jr. said of transporting live fishes for many hours without water such as grouper, tiger prawn, shrimps, snapper, seabass, tilapia, pompano, milkfish, shellfish and crabs by using what he calls the “Buhi Waterless Live Fish Transport Technology”. He further said that given the favorable conditions of its environment (which is his trade secret), fishes hibernate or simply “sleeps” and then quickly awakes once brought back to water. This waterless live fish transport technology promises to generate huge savings for the cost of live fish shipment where it will eliminate the use of water which consists of 75% of the weight, improve the survival and appearance of fishes in tanks, save on fresh fish shipment (50% on weight of ice), better fish meat quality in taste and appearance and minimize stress and prevent onset of Rigor Mortis or stiffening of the flesh. This world-class inventor from Siquijor province even successfully tested the waterless live fish technology on salmon (10 to 12 hours of transport time), abalone (14 to 18 hours) and yellowfin tuna in his research works in Australia. As president of Buhi Marine Worldwide Suply, Inc., his list of clients in the country includes Saranggani Farms, Vitarich and Century PG. His company provides service for live fish transport without water. BFAR National Director Malcolm I. Sarmiento, Jr, said that this Waterless live fish transport technology is a major breakthrough for the fisheries sector having witnessed it with his own eyes although he said that continuous tests will be conducted to ensure that no harmful residues are found. The initial laboratory tests of the Bureau of Fisheries and Aquatic Resources (BFAR) in validating this technology including necropsy and hispathology showed no traces of toxins or abnormalities on the fishes. Moreover, BFAR Regional Director Dennis del Socorro intends to tie-up with Mr. Comandante’s technological innovations to be tested and introduced in Bicol Region. They made this agreement when they met recently when the latter presented his technology with Bicolano researchers and fisherfolk in Albay and Camarines Sur respectively. Comandante is an Agricultural Engineer (2nd placer in the Licensure Exam) from University of the Philippines and holds Masters Degree in Economics from Asian Social Institute(ASI) and Costal Resources Management from Siliman University. He is also a candidate for PhD in Marine Biology and currently taking up PhD in Applied Cosmic Anthropology. Among the awards he reaped for his innovations are: Finalist in the World Bank Development Market Place in Washington D.C., USA (2007); Winner at the Philippine Emerging Start-ups Open Biz Plan Challenge (2007); Winner at the World Bank Development Panibagong Paraan in Manila (2006); Pillar of Agricultural Development Award by the Department of Agriculture (2006); Inventor’s Award by the Galing Pilipino Movement (2006); Best International Business Award by the University of San Francisco USA (2005); Outstanding Creative Research Award by the Department of Science and Technology (2005); and Innovations Award by the Department of Trade and Industry (2005). He was also featured in the Go Negosyo Book of 2007 as one of the 50 Successful Filipino Entrepreneurs with inspiring stories. On June 6-9, 2009 he will participate as contestant on a research paper competition at the International Institute on Food Technologists in Anaheim, California, USA with his research work on Innovations for Philippine Hand Line Tuna Fishermen and the Sashimi Trade.